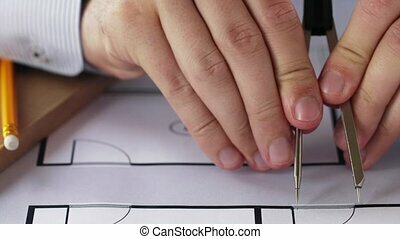 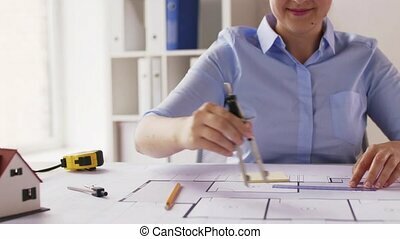 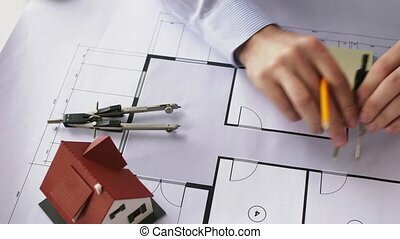 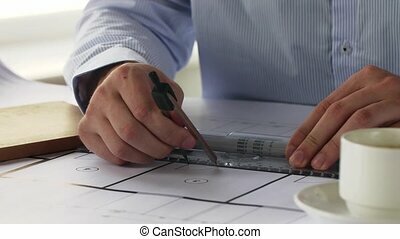 Female architect with compass measuring blueprint. 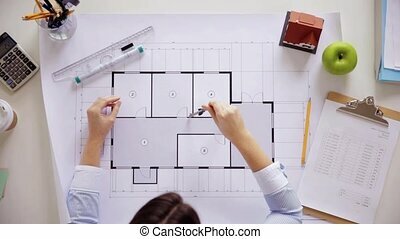 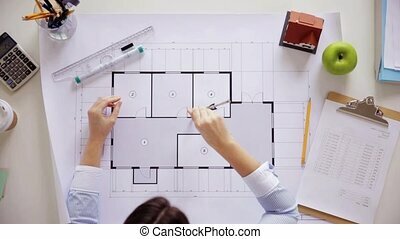 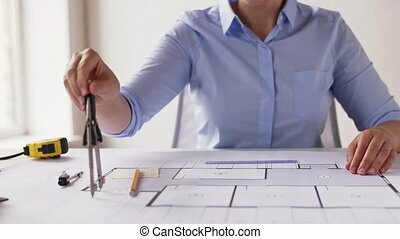 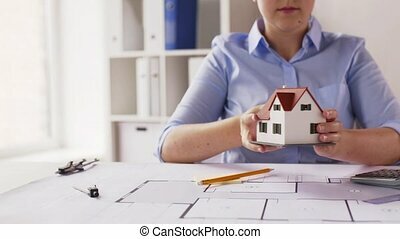 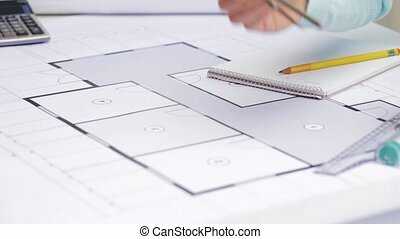 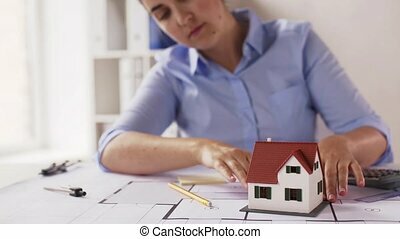 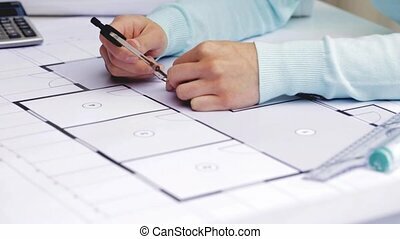 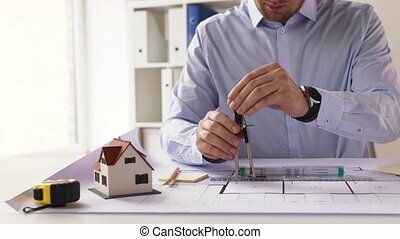 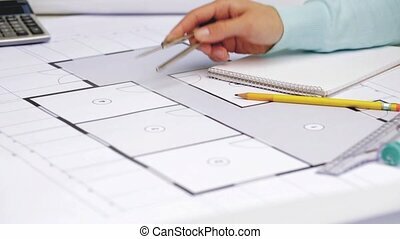 Architecture, building and construction concept - female architect hands with compass and ruler measuring living house blueprint and taking notes. 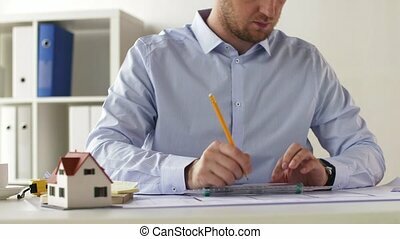 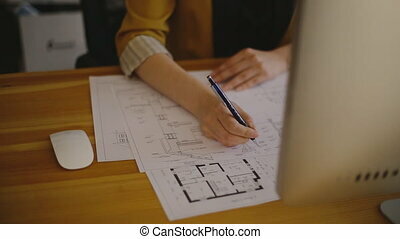 Young female architect working in office with blueprint signing details and making changes to the drawings. 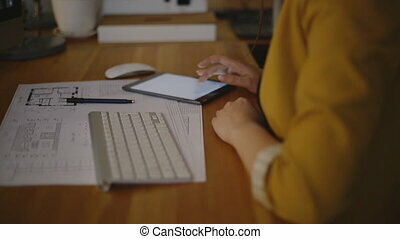 On the table lay a tablet, mouse and keyboard. 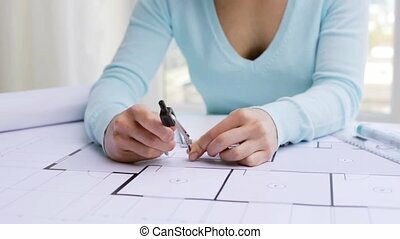 on a video, we see a woman in modern clothes with a neutral polish, which holds a professional pencil. 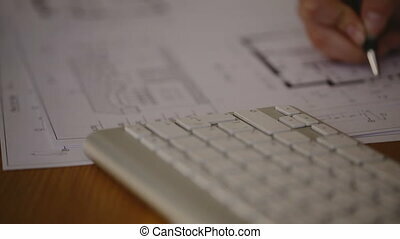 focus on foreground - the keyboard. 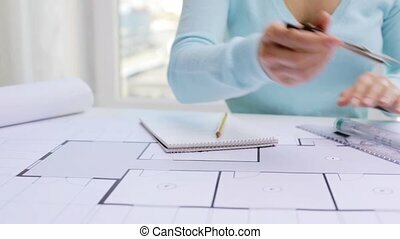 Young female architect working in office with blueprint signing details and making changes to the drawings. 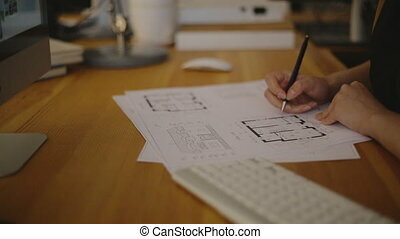 on the table, mouse drawings. 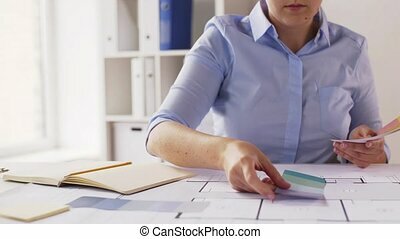 on a video, we see a woman in modern clothes with a neutral polish, which holds a professional pencil. 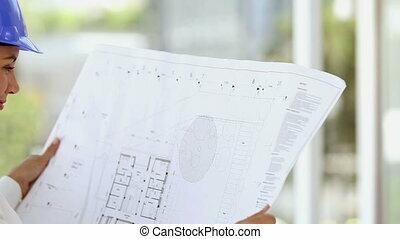 focus on the middle ground - the drawings. 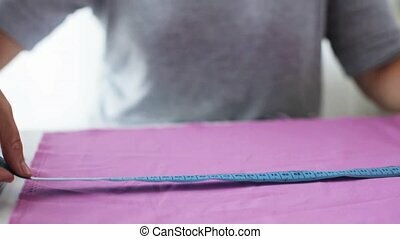 static video - without moving the camera. 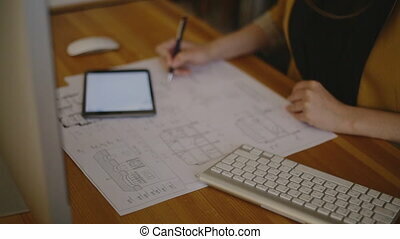 Young female architect working in office with a keyboard and a tablet and makes changes related to the computer and the tablet. 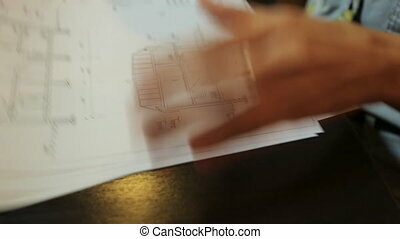 on a video, we see a woman's hand with a neutral polish, which periodically works with a keyboard and a tablet, which are located on top of the blueprint. 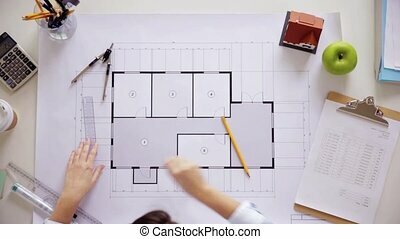 focus on the middle ground - the drawings. 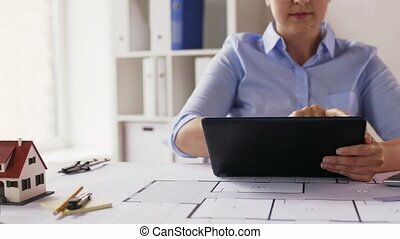 Video static - without moving the camera. 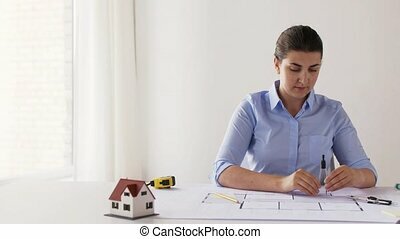 Young female architect holding a blueprint sheets with layouts and drawings of the premises. 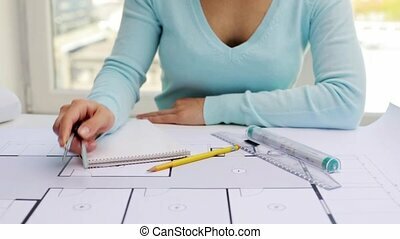 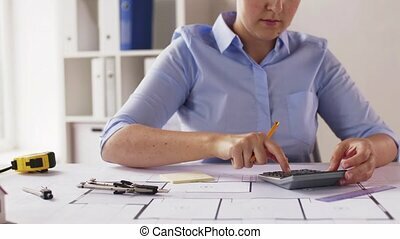 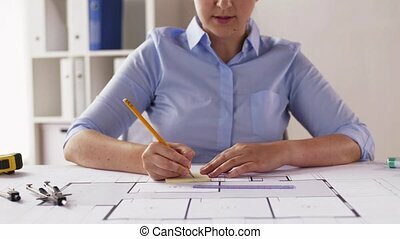 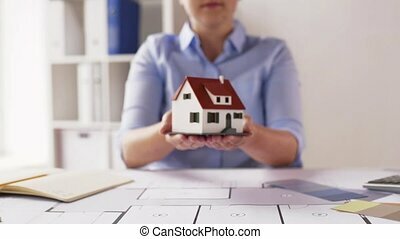 girl sits at a large wooden black table, her nice flat neutral manicure, she holds several prints A3, which drawings with cross-sections and thicknesses of bearing and bearing walls, ready construction projects at home or a big mall and next lying note pad. 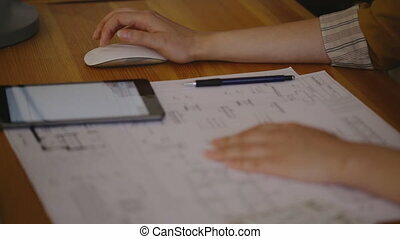 it can be either a professional or a student studying or passing practitioners. 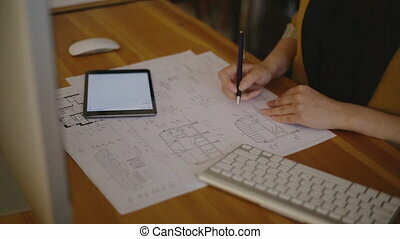 On a light wooden table lay blueprint, tablet and pen. 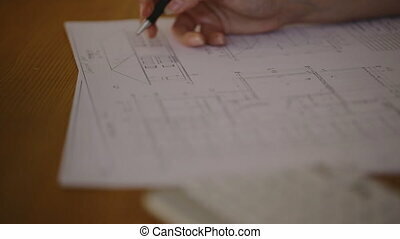 close-up Young female architect working in office with blueprint signing details and making changes to the drawings. 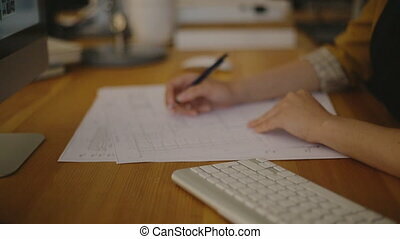 on the table, the keyboard and the drawings. 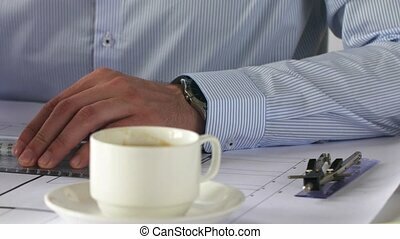 on a video, we see a woman's hand with a neutral polish, which holds a professional pencil. 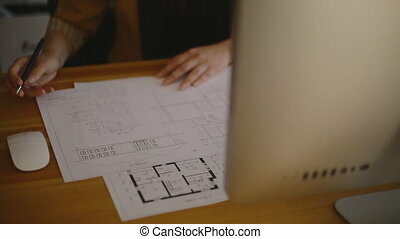 focus on the middle ground - between the keyboard and the drawings. 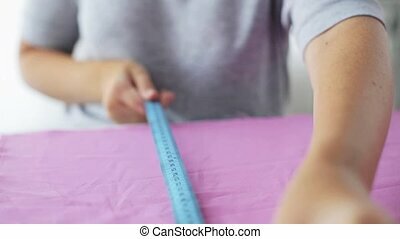 Video in Motion - the camera on the slider.